A common claim of creationists would be that evolution promotes immorality. Such claims can arise from nothing less than ignorance, and here I shall explain why evolution does promote morality and altruism, instead of challenging it. Science is a method to understand the world around us, and it does so through the scientific method, which is tried-and-true. Now, as science observes and make conclusions, that means it is descriptive – it simply tries to give us a better understanding of the world. To blame immorality on scientific theories is simply absurd, as science is not an instruction manual - it is up to us to determine what actions should we take. This is very unlike religion, which explicitly and repeatedly requests that we follow its teachings, making it instructive. Moreover, it does so through blind faith, not through reason and evidence. Creationists also frequently claim that the teachings of natural selection leads to Social Darwinism, which is political ideology in which only the “fittest” survive, and the weak are left to die, and Adolf Hitler implemented this system. His rationale was that based on the misunderstanding that natural selection meant “survival of the fittest”, and the Catholics are superior to Jews, thus Jews must be exterminated. Creationists frequently refer to his actions as evidence that evolution leads to immorality. Yet, this is not the case. Natural selection doesn’t necessarily means that a particular individual must kill as many other organisms as possible; nor does it mean that an individual must be vastly superior to other individuals to survive. It simply means that the phenotypes that are better adapted to the habitat would have a greater chance of reproducing and passing on their genes (or more specifically, alleles). The phenotypes do not need to be competing with each other to survive – they can be helping each other directly or indirectly, increasing both individual’s fitness. Such interaction between 2 different species is known as mutualism (between sea anemone and hermit crabs, bees and flowers, ungulates and digestive bacteria etc); within the same species, it is known as co-operation (ants, bees, and of course, Homo sapiens). Is what is moral commanded by God because it is moral, or is it moral because it is commanded by God? Kin selection refers to the theory that organisms may display caring towards their relatives, thus increasing their relatives reproductive fitness but at a cost of their own fitness. If viewed from a purely competitive and individualistic perspective, natural selection would’ve got rid of individuals that exhibit such behaviour, and thus genes that promote such behaviour would rarely (if ever) reach fixation. However, such behaviour is found in many organisms, the most famous example be the infertile worker ants and bees, who are unable to reproduce and yet decide the fate of the entire hive. where r = coefficient of relatedness between the individuals, B = the benefits in fitness received by the recipient, and C = the cost in fitness imposed on the actor. The value of r can be calculated pretty easily. In a diploid organism, an offspring gets exactly half of its genes from one its parents. Thus their relatedness is 0.5. For the cousin and grand offspring, they get 1/4 of their genes from one their last common parent, and thus their relatedness with that parent is 0.25. Based on this equation, we know that r=n5. Hamilton proposed 2 ways in which altruism would be favoured. The first is when kin recognition is high enough, which means that an organism favours those that are more genetically similar to it. However, as organisms are most certainly unable to measure the genetic relatedness of a relative, kin recognition only occurs if the particular genes can have externally visible phenotypical effects. This is known as the “Green-beard effect”, and it serves as a valid explanation for the evolution of morality. Kin selection can also happen even if kin recognition is not present in viscous populations – a population in which the movement of organisms from their birthplace is relatively slow. In viscous populations, individuals will frequently breed with close genealogical relatives, and thus Hamilton’s rule can be met. This doesn’t explain altruism, though. Reciprocal altruism refers to the behaviour that an individual would help another individual in the hope of mutual interaction with the recipient in the future. In social terms, it’s: “I helped you, and thus I expect you to help me back.”. This is a very possible explanation for the evolution of morality (and revenge), as this behaviour is see in cleaner fish, vampire bats (possibly), chimps, orang-utans, and of course, human society. 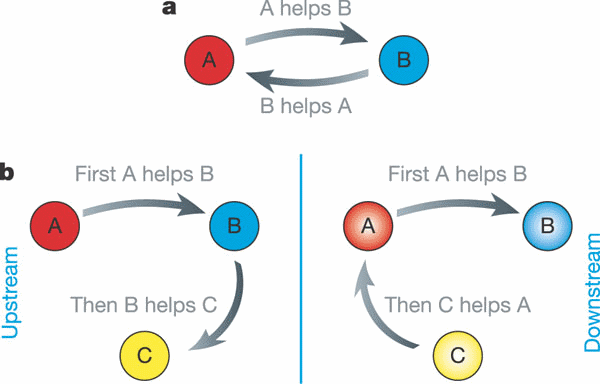 It’s also used to explain why humans help strangers, which are hard to explain using kin selection. Robert Trivers presented direct reciprocity as a model for the evolution of cooperation. This form of reciprocity requires that the 2 individuals meet again, recognize each other, and remember their last encounter to predict what would happen in the future. Direct reciprocity is highly similar to the Prisoner’s Dilemma (PD). In this dilemma, there are 2 individuals. If both cooperate (C), both will gain rewards (R); while if both defect (D), both will get penalties (P). However, if one individual cooperates while the other defects, the co-operator will be penalized, while the defector will be rewarded handsomely. where w = the probability of another encounter between the same two individuals, c = cost, b = benefit. Thus, it is required that the probability of another encounter between the same two individuals exceeds the cost-to-benefit ratio of the act. Indirect reciprocity doesn’t require repeated encounter between the same individuals. In indirect reciprocity, one individual is the donor while the other is the recipient. The donor can decide whether to cooperate and help the recipient. The “upstream” model states that when the donor helps the recipient, the recipient will be motivated to help another individual, perhaps because he/she got a positive feeling about it. This may create a domino effect which spreads through the community. While this model is harder to understand in detail, it has been observed in economic experiments. This model is based on reputation. If an the donor helps the recipient (and someone knows of it), his/her reputation will be enhanced. Such a system is all too common within human society, and studies have shown that an individual of good reputation is more likely to be helped by others in the animal kingdom as well. where q = probability of knowing someone’s reputation, c = cost, b = benefit. In other words, it only works when the probability of knowing someone’s reputation exceeds the cost-to-benefit ration exceeds those of the altruistic act. Diagram (a) shows direct reciprocity, in which A helps B, and B helps A, or they may defect. Diagram (b) shows the “upstream” model, which is based on motivation; and the "downstream" model, which focuses on reputation. In many animal societies, the female are responsible for taking care of their children. This is very detrimental to the survival of the mother – it requires time, energy, and resources. Now, if both parents are responsible for caring the children, the load would be ultimately be decreased for the mother. However, that doesn’t work if the father (biological or not) doesn’t even think of the children, much less care for them. Thus, it is proposed that females may have preferred loyal, caring partners over individualistic partners, and thus the “moral” gene is the one had a great probability of being inherited. In this post, I not only debunked the creationist’s claim that evolution leads to immorality, but also gave an explanation on how evolution is perfectly able to explain altruism as well. I’ll wait for creationists to refute what I just said. As a side note, though, all the explanations above have one thing in common: they all imply that altruism succeeds because of selfishness. Kin selection is not “true” morality, one only helps those that are closely related genetically, and that doesn’t fit with how our society thinks morality should be. As for reciprocity, it happens because the individual expects something in return. In direct reciprocity and perhaps the “upstream” model of indirect reciprocity, you help someone because you want to get help from them in the future. Hell, they’ve got this Chinese saying that “Good deeds shall be rewarded in return”, and I simply hate it when charities used this saying to urge us to donate – that’s actually an act of selfishness. In the “downstream” model of direct reciprocity, you help someone, and you get reputation for it. Who doesn’t want it? Some may protest that this is caused by the willingness of the spectator – the donor didn’t explicitly want better reputation. I doubt that. I’ve seen a lot of cases (including mine) when an individual helps someone because he thinks that’s politically correct, because people may look down upon him if he/she doesn’t lend a helping hand, because by doing he feels “good” etc. Self-centeredness under the guise of helpful acts, that’s what we all (or at least me) see in most cases. However, despite my cynical view of morality, I don’t think that it should be removed from society or ignored altogether. At least, it still maintains harmony and peace much better than a purely competitive mindset. I really hate that argument. It takes just a little bit of thought to figure out its wrong. The individuals in groups do better than individuals on their own. And for groups to maintain themselves there has to be rules. Right there is an evolutionary origin for morality. Its that simple. However, morality from evolution is subjective and changes over time! Only the Bible's moral code are true and factual! Yeah, right. It seems we have another case of confirmation bias or argument from ignorance here. Creationists should at least try to understand natural selection before touching on this topic. Could you type, in Chinese Characters with transliteration, the Chinese saying "Good Deeds shall be rewarded in Return". Likewise, a friend who helped me recently, when I said thank you, he said, "A favor is money in the bank". I think that understanding is good. We should realize that the world is tightly connected and favors often come around and benefit you. Yes, selfish, but useful. And though I agree that many of our peaceful, cooperative behaviors are functions of evolutionary mechanisms in the mind, we also have violence as the same. So then the choosing between them is what makes a person. So evolution gives options, but it does not determine morality. But I absolutely disagree (with you) that atheism does not promote immorality. Nonetheless, I think atheists have a challenge to suggest secular methods of nurturing desirable morality in cultures. This ain't easy ! Hey, if you have a chance, why not do a post "Declaring Your Atheist Positions!" -- Smile. Yes, Sabio, I surely would translated it. It's called "好心有好报 hao xin you hao bao". There you go. And by the way Sabio, I wasn't talking about the promotion of immorality through atheism (perhaps more on that later, my views are mixed), but through a correct understanding of evolution. Anyone who have studied natural selection fully will understand that altruism is beneficial to social beings (humans included) in a lot of cases. I'm still reading it, but I find it very relevant to this subject. Thanks for the link, godlizard! Agreed, altruism is an evolved skill Thus, I don't think we can not derive a model for morality from evolution. We can only explain moral abilities from evolution mechanisms. We don't want to make the naturalistic fallacy. It is fun discussing with another non-believer who values compassion.